Join Mouse on an adventurous journey through the deep dark wood… meet a wheeler-dealer Fox, an eccentric old Owl, a maraca-shaking, party-mad Snake! Mouse can scare these hungry animals away with tall stories of the terrifying Gruffalo, but what happens when he comes face to face with the very creature he imagined…? 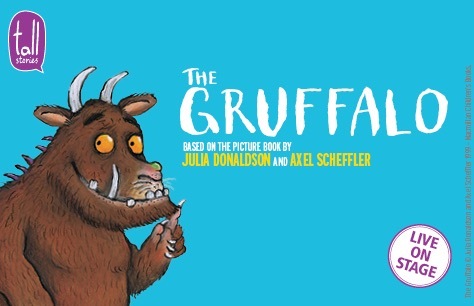 The Gruffalo is a musical adaptation of the best selling picture book written by Julia Donaldson and illustrated by Axel Scheffler and features colourful, comical characters and is a fun and lively mix of song, dance and drama. This production is recommended for children aged 3 and up. Babes in arms comps to be issued to children under 18 months of age only at the venue on arrival. Please ask for them at theatre box office on arrival. BSL performance – Wednesday 17th July 2019 11am. Relaxed Performances – Friday 12th July 11am & Wednesday 7th August 2pm.